Transition Initiatives aim, from an early stage, to begin to create practical, high visibility examples in their communities which can show people what a low carbon future could look like. These can help to get people involved, be useful projects for us to learn what works, increase our skills and provide models which can be scaled up in the future. Schools and children – we will initially work with Brookfield primary school and are planning an assembly on recycling and some classroom sessions on energy in February. We’re also working with the PTA to set up a kids and parents after-school gardening club there in Spring. Food growing – we’re starting a public food growing project at Highgate Newtown Community Centre and will hold a series of gardening workshops there. The food we grow will supply the HNCC cafe, and be used for seasonal cooking sessions and events. We also plan to map and make links with existing food growing spaces in the area, and some of us who are residents of Brookfield estate are starting a food growing project with our neighbours. We also hope to start a ‘garden share’ project to match growers who lack space with elderly people who need help maintaining their gardens. Fruit tree mapping – over the course of this year we will start to map fruit trees and the area and plan to pick and help others pick as much as possible. Our aim is to stop food going to waste, get people eating locally, make lots of apple juice and maybe even some cider! Energy efficiency – some of us have the skills to give help and advice to those wishing to make their homes more energy efficient. We plan to run talks and skill-sharing sessions showing how even small changes can make a difference. Arts, craft and DIY – we will hold a monthly craft session to learn new skills and reduce waste, including: knitting, up-cycling, sewing, making soaps and cosmetics, and lining curtains. Our first session will be ‘cloth bag making’ – look out for details soon. We also aim to put together a DIY tool-kit and hold some sessions on basic home repairs, installing energy efficiency measures and making some fun things from wood. Community care – we aim to combat isolation in our society, make intergenerational links and learn ‘lost’ skills from elders. Ideas included befriending, skills workshops like sewing, and a garden share scheme. 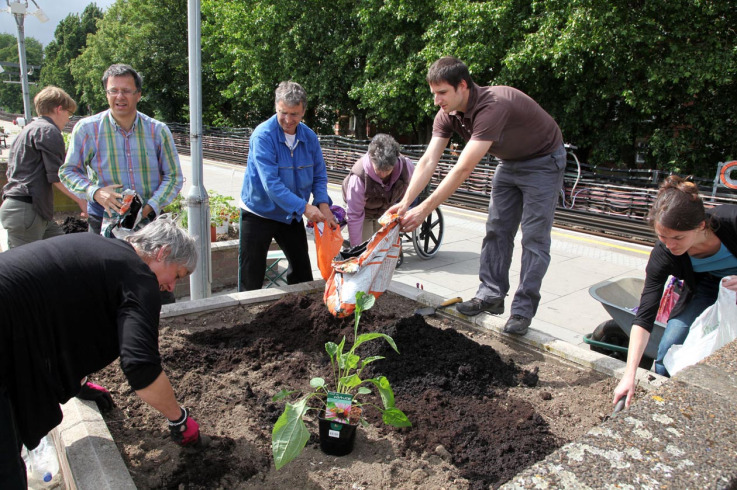 Transition Kensal to Kilburn run five food growing spaces, including one on their local railway platform! They have also started a bee-keeping project in a cemetary. All of the spaces have community involvement and provide a way for people to learn the skills to grow their own food. Transition Belsize began a Draught Busting project to teach people how to simply and cheaply insulate their sash windows. They also bulk order the materials and supply local residents. The project has been so successful that Transition Initiatives across London have adopted the model, and Camden Council have contracted them to insulate several schools.